"Yidl mitn Fidl" is one of a small number of movies that we can view that give us a precious glimpse into the shtetl life of pre-war Poland. It became the most successful Yiddish movie (with sound.) The exteriors were filmed in Kazimierz Dolny (the interiors in a Warsaw studio), a picturesque Polish town that sits adjacent to the Wistula River, "Yidl" features Molly Picon as Yidl, a young fiddle player. 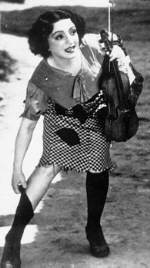 Yidl and her father Arye (Simche Fostel), a bass player, are very poor, and decide that it would be best for them to go on the road, hoping to play in the streets for Polish zlotys. Yidl pretends to be a boy for, as her father says, she will be safer that way. 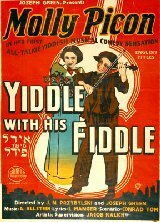 While the two of them are playing for coins in a shtetl (thrown down to them from windows), they begin to compete with two men, Isaac (Max Bozyk), a clarinet player, and a young and handsome Froim (Leon Liebgold), another fiddle player. They decide to join forces and find success on the road. Yidl is entranced by Froim's fiddle playing, and she falls in love with him. She sings the well-known Yiddish song "Oy Mame, Bin Ikh Farlibt" to his music. The plot has some twists. Because Yidl is pretending to be a boy, she cannot express her love to Froim. This brings her to tears. One day, the four of them play at a wedding. The bride Teibele (Dora Fakiel) is a reluctant bride, as she definitely does not want to marry this much older man. She is in love with a young man named Yosel, who has disappeared. Her family, however, is in a great deal of debt, and thus they have had to arrange this shiddach. The marriage seems inevitable. Yidl feels the bride's sadness and decides to rescue her. The five of them escape through the fields and head for Warsaw. Froim promises to find her Yosel. Meanwhile, Yidl is jealous of Teibele, thinking she and Froim are attracted to each other. The runaway bride joins the quartet of musicians and sings while they play. A theatrical producer hears Teibele sing from his office window and tells them to come upstairs. He offers Teibele a contract and schedules her to sing in Warsaw at a concert hall. The night of her debut, she is both frightened of going on stage and sad because she hasn't her Yosel. Just before she is to perform to a full house, Yosel, who has been found, shows up at her dressing room. Yidl, who at first was not going to go to the performance, shows up at the dressing room and sees a note left by Teibele, stating that she wouldn't perform and that she has run away with Yosel. Yidl decides to try on the dress that Teibele was to wear for her first performance, so she can feel again how it is once again to dress up as a woman. A knock is heard on the dressing room door. It's time to go on. Yidl decides that she should go on stage and tell the audience that they should go home, the one who they came to hear sing is not there. She tumbles into the orchestra pit (Froim got a job in the orchestra and helps her back onto the stage), and the audience thinks that this is part of the act and laughs heartily. Yidl continues to tell them to go home, and sings refrains of "Yidl mitn Fidl" and "Oy Mame, Bin Ich Farlibt" (Oh Mama, Am I in Love). She is a hit, and after the show is offered a contract, but Froim overhears that he will not be offered a job with her new act, though she wants him to have one. He writes her a note in Yiddish on a mirror in her dressing room, saying that he has decided that he really didn't love her, wishes her luck, and disappears. Years go by, and Yidl has found success on the stage. While she is traveling on an ocean liner and is dining with her father, she hears a fiddler playing in the orchestra, and discovers that, by chance, it is Froim. As the movie ends, they are on deck, smiling, staring into the starry sky, hand in hand and cheek to cheek. The movie was wonderful to see. Sure it's corny, the sound isn't great and the dialogue is not first-rate, etc. However, one doesn't see this film for such things. Most of us have never lived in pre-war Poland, nor have we spent any time living in a shtetl. Many of the people we see in the film were actually citizens of the then mostly Jewish Kazimierz. With the exception of Philadelphia-native Molly Picon, the rest of the cast were native to Poland, having already been acting in various Warsaw-based ensembles. We can only imagine what it must have been like to live during that time. Already life was becoming very difficult for Jews. Today, we can only look at old family photographs, listen to stories about the past told to us by the elders in our family or we can read passages in Yizkor books. "Yidl mitn Fidl" gives us a rare visual look at actual shtetl life in a real Polish town populated largely with Jews, just a few years before many of those who acted in the film, as well as those who lived in Kazimierz itself, would meet a horrible fate. "I had never seen such poverty---outdoor plumbing, rickety wooden houses bent into fantastic shapes, and the people unbelievably threadbare. The skeletal children, with their long payess (sideburns) and little yarmulkes (skullcaps), wore trousers that were in shreds and shoes tied on their feet with rope. My heart went out to every one of them. We gave them coins (they wouldn't accept food--it wasn't kosher), and with the coins they bought grapes and came back to share them with me."